Product information "HAIX Airpower XR1 Womens, FS"
Developed with the wildland firefighter in mind, these boots can take you to the fire line and back with the comfort you need when logging long hours in the station. A dual purpose women's fire boot that is NFPA certified for wildland firefighting and EMS, you have the convenience of two boots in one. Anatomically constructed and built with a lightweight composite toe, HAIX® Airpower XR1 boots give your feet plenty of room to move around while protecting them from toe impact and compression because there is nothing worse than a protective toe that pinches or restricts your movement. The HAIX® Airpower XR1's built in arch support provides much needed support to the arch, which takes the brunt of the pressure when standing. Proper support of the arch helps to prevent foot pain when on your feet all day and possible foot problems later on. The newly developed cushioned insole offers the ultimate in comfort, especially when combined with the built in arch support. And with the laced in zipper system, any firefighter can adjust the lacing for a more personal fit while enjoying the benefits of a quick in and out boot. Because on the job, seconds matter. The HAIX® Airpower XR1 is both a breathable and waterproof EMS boot, with the added benefit of chemical and bloodborne pathogen protection. Working in tandem with the HAIX® climate system, your feet will stay dry, comfortable, and protected –even in times of extreme exposure to water. The Airpower XR1 women's fire boots offer all of the HAIX® quality you have come to expect for long lasting comfort and durability. The all leather upper material uses Sun Reflect technology which reduces the solar heating effect and keeps feet cool by reflecting the sun’s rays. 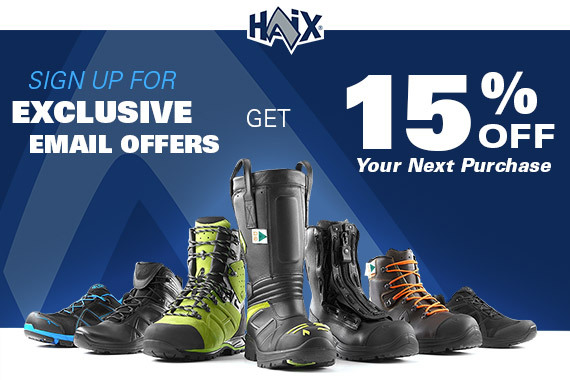 The soles of the HAIX® Airpower XR1 waterproof EMS boots are extremely slip resistant which offers an effective grip when exposed to water and oil. So even when you’re on a rescue and you’re running on tile, hardwood, or linoleum flooring, your shoe will be able to grab hold. The insoles are anatomically formed to deliver a perfect fit and are made to provide excellent moisture absorption and as well as quick drying qualities. When your insoles get completely dirty after long days on duty, all you need to do is throw then in the wash, air dry, and they’ll be ready the next day’s work. Related links to "HAIX Airpower XR1 Womens, FS"
Our comment on "HAIX Airpower XR1 Womens, FS"
Customer reviews for "HAIX Airpower XR1 Womens, FS"